Chocolate and strawberries are partners in romantic indulgence. These delectable little morsels can hold their own in so many situations. Whether handed round on a party canape tray, kept in the fridge for a sweet afternoon treat, or served as a romantic dessert for two, it’s hard to go past plump strawberries tucked into chocolate. The hardest part is usually melting the chocolate but Panasonic microwaves with Inverter technology heat evenly so that you’ll get the perfect chocolate melt in a flash! Wash and arrange strawberries on skewers. 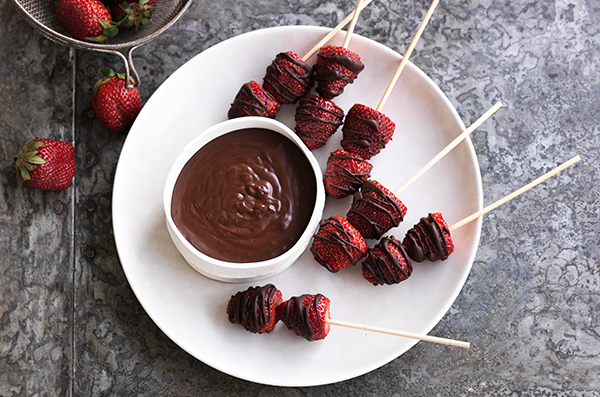 Serve strawberries with the extra chocolate in a small dipping bowl.